I know. That title is terrible. But this ice cream cake? SO. NOT. TERRIBLE. 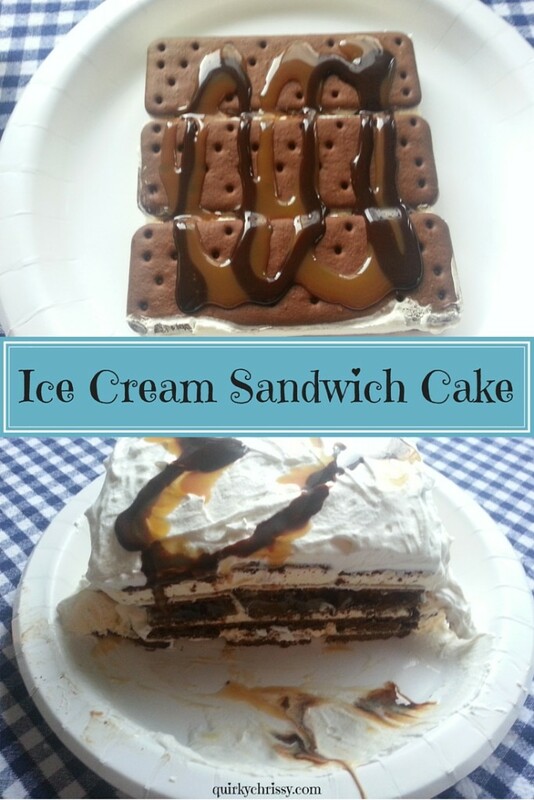 So last week, Brian sent me an animated gif with ice cream sandwiches becoming a cake. With Brian’s birthday this past Saturday, and the fact that he NEVER requests things like that…I knew I had to make this cake. Of course, there was no how to on the gif, so I made it up as I went. Yesterday, we celebrated my brother-in-law’s birthday, Brian’s birthday and sort of my brother’s birthday (he’s 30 this year, so we’ve got another party for him next week). I got all the ingredients to make this sweet little cake and dropped them off at Mom’s. After dinner, I pulled out the ingredients and quickly whipped this cake into shape. It was seriously the easiest thing ever. And the 15 minutes? Totally included picture taking. Also, don’t you dare judge my super awesome chocolate caramel heart on the top of the Cool Whip. I forgot to bring maraschino cherries. You guys, this was seriously delicious. Everyone enjoyed it. It got a little messy near the end–definitely more difficult to cut than I thought it would be. Just make sure you slice all the way through the cookie layers, and you’ll be good to go.